Earn $1.93 in Rewards credit (193 points) What's This? 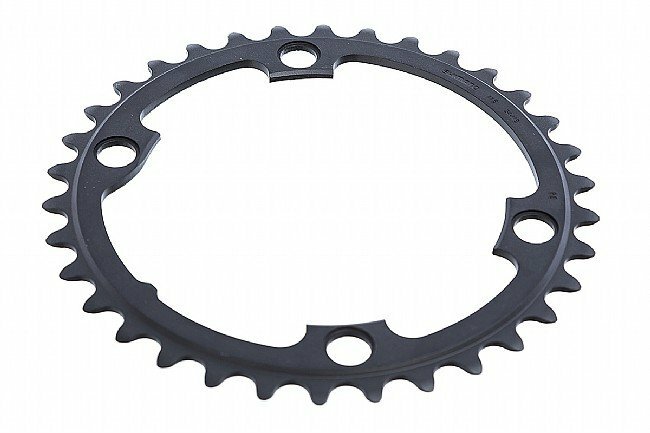 Featuring a slightly redesigned tooth profile, the new Shimano Ultegra FC-R8000 11-speed Chainring is available as an aftermarket purchase to provide customizable gearing for your bike. Designed for improved shifting and chain retention, the Ultegra R8000 chainrings feature Hollowglide technology to keep them lightweight and super stiff. The Shimano Ultegra FC-R8000 11-Speed Chainring is available in 7 different gearing options from 32 – 53 tooth. Only compatible with the Shimano Ultegra R8000 Crankset. Ultegra is a solid product in my experience. First time dealing with Western Bike Works and completely satisfied. Awesome! Delivered what I ordered at great price and on time! Had these chainrings dropped onto Quark D-Four Power Meter Cranks and fit like a glove. The rest of the gruppo is all Ultegra and performs flawlessly as expected. Dura-Ace is nice, but Ultegra is the workhorse of the Shimano line...light, bulletproof, affordable and dependable! Great deal from Western Bike Works! I'm convinced SRAM is going 1x because they can't infringe on Shimano's awesomeness and actually make a decent front derailleur. I recently switched back to a Shimano front and love it. Changed gearing, Shimano parts work! Changed gearing for shimano 8000 with shimano 8000 so what can I say, they work as they should! Came stock on the bike so just a maintenance purchase but really it's Shimano Ultegra, works fantastic with Di2. Original parts lasted a long time so no disappointments there. Smooth quiet and reliable. Shimano 6800 for Shimano 6800 so worked great! Bought a smaller ring for hill climbing on my CX bike. Easy to switch out rings when the season changes from long gravel rides to CX races.